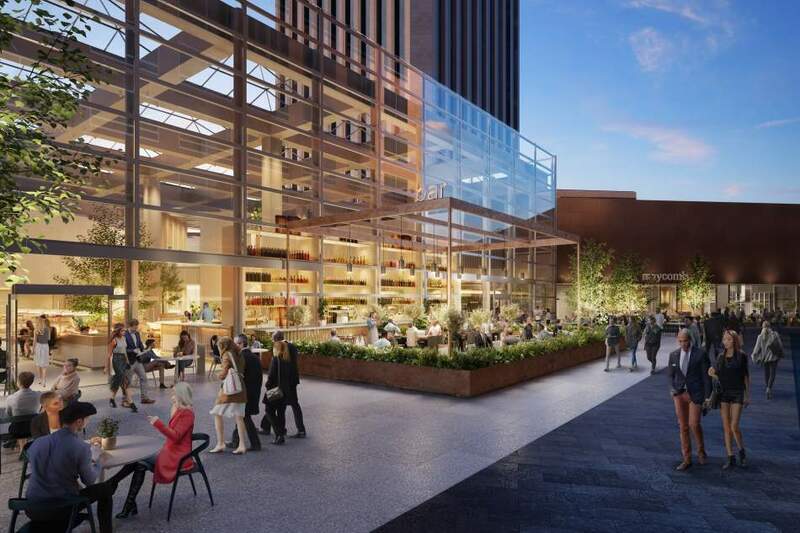 Brookfield Properties and SOM have unveiled new renderings for a forthcoming $60 million renovation of the Lawrence Halprin-designed public plaza and atrium spaces located at the foot of the Wells Fargo Center towers in Downtown Los Angeles. 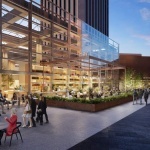 Originally designed as an “urban, indoor Garden of Eden” with developer Robert Maguire and Modernist sculptor Robert Graham, the Halprin-designed atrium space was demolished in late 2017 without announcement and will now give way for a new kind of “amenity-rich” Eden populated by two restaurants, a fitness center, an indoor-outdoor bar, and other small-scale food vendors. 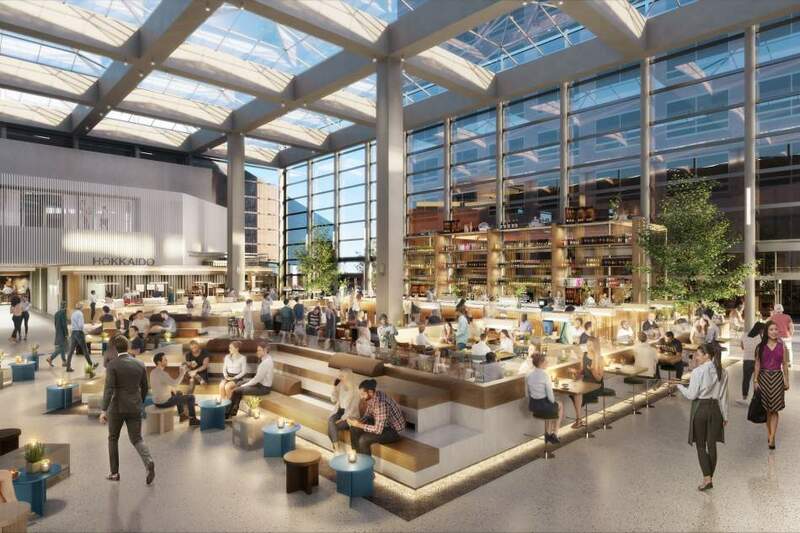 Gone are the Robert Graham-, Joan Miro-, and Jean Dubuffet-designed sculptures that once populated the fountain-laden atrium, to be replaced with wrap-around booth seating, a stepped amphitheater, and a bar. 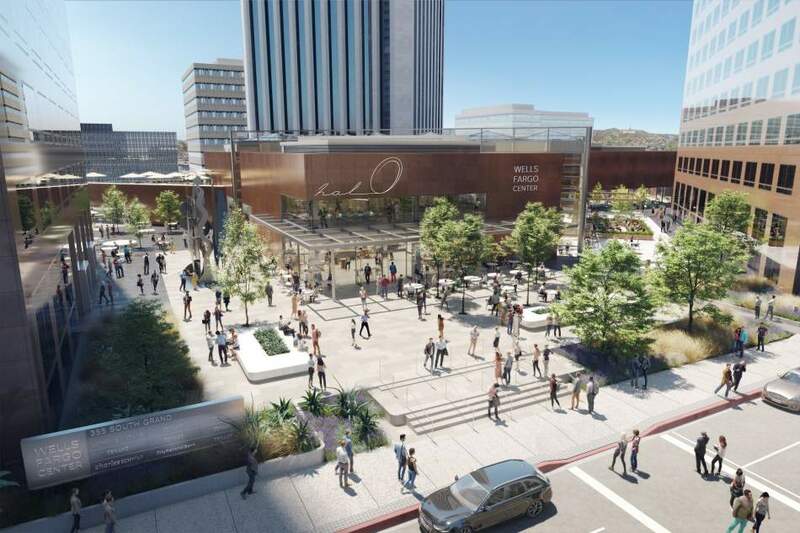 Renderings for the new SOM-designed plaza spaces surrounding the ground floor atrium project depict a more open frontage along the site’s Grand Avenue edge, with existing pink granite-clad knee walls to make way for new planted areas and rounded bench seating. 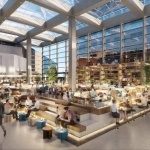 The formal atrium structure will also be softened via the introduction of a new open-web metal awning structure along its front. 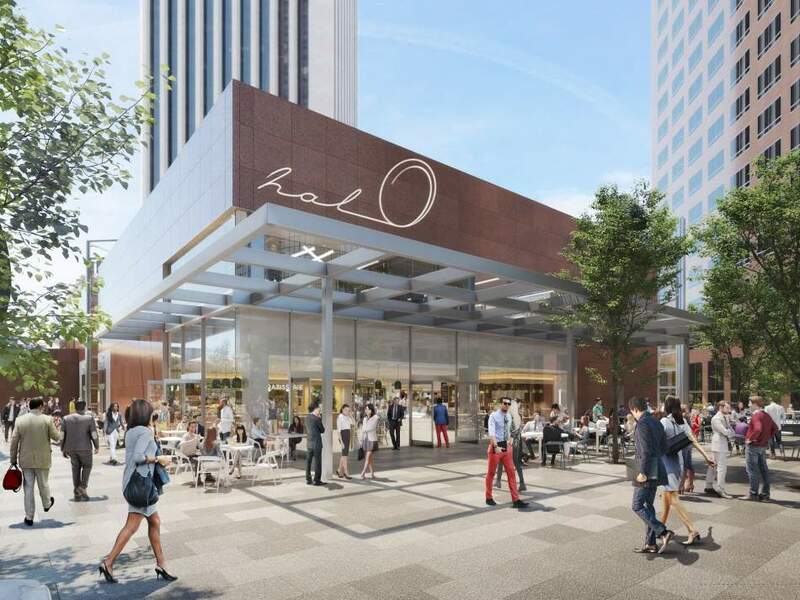 Areas overlooking Hope Street on the opposite side of the complex will also receive upgrades, with renderings depicting shady terrace spaces and new cabana structures wrapping the second story retail spaces above the street. 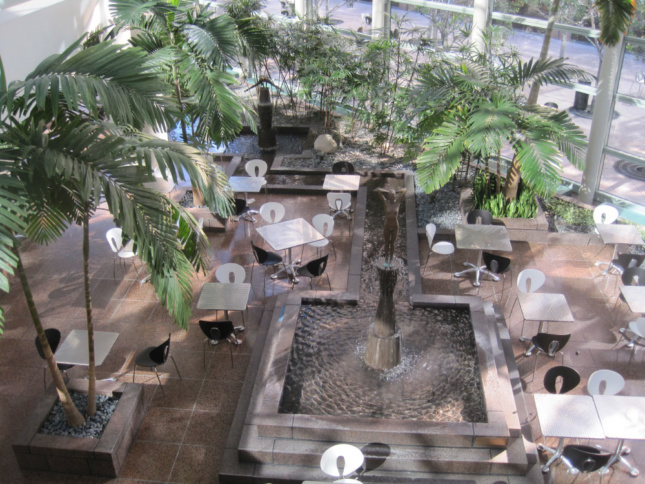 Halprin’s atrium was designed in 1983 as the first component of the Los Angeles Open Space Network, a string of indoor-outdoor plazas, gardens, and parks linking the new Bunker Hill area with the South Park neighborhood to the south. 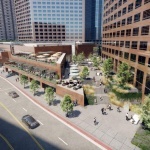 The network was bookended on its northern edge by the atrium and includes the nearby Bunker Hill steps at the foot of the Pei, Cobb, Freed-designed US Bank Tower, the adjacent Maguire Gardens Park, and Grand-Hope Park. 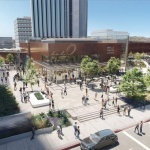 The network was not listed as a historic resource either locally or nationally prior to the demolition of the Halprin-designed atrium. SOM originally designed the twin 54- and 45-story story towers on the site in 1981–they were completed in 1983–amid Bunker Hill’s initial transformation from Victorian-era upper class suburb to the purpose-built postmodern business district in existence today. The austere, reflective granite-clad towers present an angular presence on the skyline and are memorialized in Fredric Jameson’s seminal tome Postmodernism, or, The Cultural Logic of Late Capitalism as prime examples of the era’s new “depthless” and “literal” architectural mode. 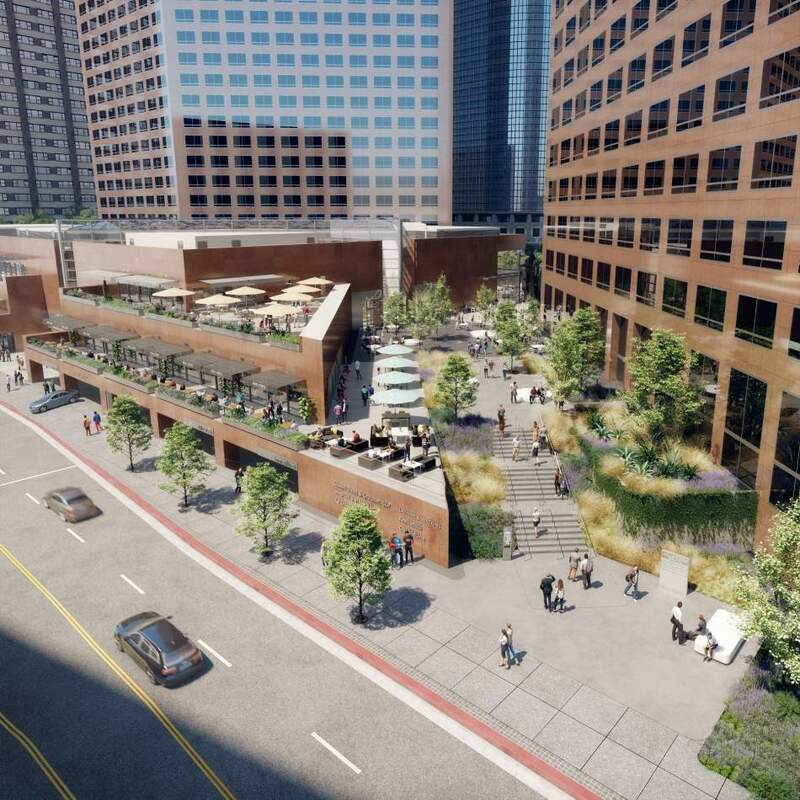 The changes to the Wells Fargo Center come amid explosive change in the city’s Bunker Hill area, with a massive Gehry Partners-designed $1 billion mixed-use complex, a new Colburn School complex—also by Gehry—and renovations to the Music Center Plaza led by RCH Studios all currently under development. 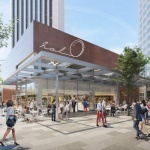 SOM’s renovations are already underway and are expected to be complete by 2019.